Camille Reads receives a small commission for any purchases made through the links above. Have you ever read a book so emotionally heavy that you want to take a break from it and yet you can’t convince yourself to do so? That is how I would described my experience reading No Fourth River. Before I even began reading I was filled with a trepidation. Was I really up for reading a true story on abuse? As someone who has been in the throes of relationship abuse, Christine’s story scared me. Even knowing No Fourth River is non-fiction, I was still very surprised with how honest Christine narrated her life story – there were no hazy details, no softening of the humiliation – everything was laid bare for the readers. Now, this was at a time when people considered domestic abuse normal; abusive men were simply considered as disciplinarians. Even if the women wanted to leave, during then there was no social support for the victims. So, even though Christine’s mother might have been in a privileged and powerful house, her own identity and her own personal problems were tucked into the family’s back pocket. I cried with this book. It was so heartbreaking to read of how Christine suffered at the hands of her bullies – at home and at school. There was no safe place at all! Yet, in spite of the beatings and being called useless, in spite of the mistakes she made, Christine found the strength to forgive herself. This is something I want people who read No Fourth River to take back from it. Christine’s story taught me that no matter how low we fall, no matter how “bad” we become, there is always a way back. The road back is one we build with our own hands and, honestly, we don’t need the bricks and the cement just yet. All we need to do begin walking it. For me, reading about Christine’s abusive relationship was the hardest. I cannot write this review without getting personal, to be honest. But that is what I believe this book aims for. It wishes to touch its readers on a personal and emotional level. It was to jolt us awake and away from any harmful situation we are in. No Fourth River leaves no room for guessing; it is written with complete honesty. There is great detail about the bad and even the good; for some, this may make for an uncomfortable read. Though the inclusion of the love letters felt a bit off for me, it also made me think how we don’t do enough to celebrate love with a carefree nature. While we are ready to read about a troubled childhood, why aren’t we keen on romance? Christine lays claim to both her terrible past and her own wonderful present. I admired how the author wrote frankly about her achievements, owning it. Christine worked and went to evening schools, while in an abusive relationship, so that she could shape her future. After she left, she continued to pursue courses outside of her comfort zone eventually leading her to become a dealer for computers in Belgium. Christine made use of her keen mind to find what was needed and made a business of it. On a personal note, this – celebrating one’s victories – is something that survivors of abuse struggle to do. We shy away from trumpeting our achievements out of the belief that they are not our own. So it was very refreshing and inspiring to read Christine’s life and feel like, why am I shying away? Why don’t I speak up of my own victories? This book is more than just about an abusive past and the struggles to get out of it, it is a celebration of women who swallowed the fire, so she could light her own way. Thank you, Christine Clayfield, RASC Publishing and Bookollective for providing me with a e-copy for my honest opinion. 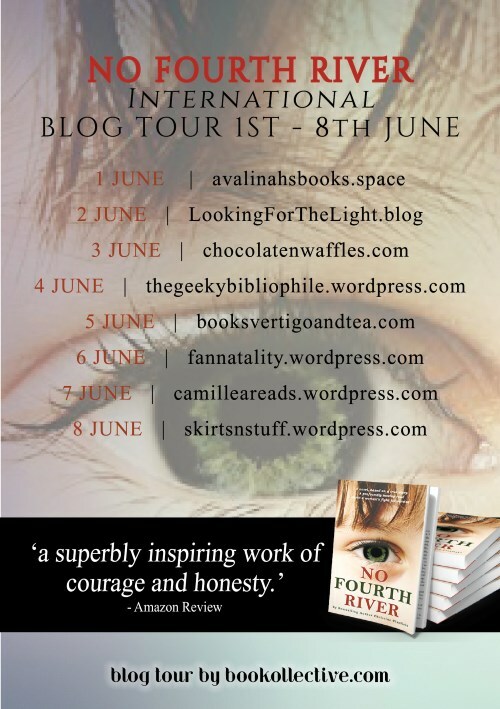 Below is the schedule of the international blog tour for No Fourth River. Disclaimer: Text dividers are from Freepik. Camillea Reads uses affiliate links, which means that, at no cost to you, I receive a small commission whenever purchases are made using the links. I need to read this book! I loved reading Educated and No Fourth River sounds like another extremely powerful memoir. What a great review! This is such a great review! I definitely agree that the book is written with so much honesty that it’s real in itself. There’s no guessing and there’s no portrayal of right or wrong; there’s just a women’s journey. I’m so glad you liked this book because I liked it too! This sounds like an incredible book but also so so hard to read. 😭 I’m so glad the author was able to share her story though!! And also learn to celebrate her successes and heal…so encouraging and powerful. Before I forget, OMG I love your new headers! Maybe not super New but lol I have not blog hopped in a long time. That’s why! And I’m glad you liked the book. I can sum up my own feelings about this book in a very similar way! I couldn’t believe how she managed to grow like this, so fast – a sudden, life changing even can be like that. My story has many similarities because I was bullied and had an abusive father too, but I guess I never had anything so sudden so the change was very slow for me (and it’s still happening). The story has so hard to read… but also so necessary. One of those books I know I’ll never forget. WOW this sounds like such an intense, emotional book! I often find that the books that are the toughest to read are sometimes the ones that are the most important to read.